We’ve got a wide variety of participants coming to the LOD-LAM Summit, so suggesting a reading list is kind of tough. Keep in mind that participants range from technology staff, policy makers, developers, librarians, digital humanists, hackers and everywhere in between. I’m going to throw out some of my favorite books and articles, but please add more in the comments as this is by no means exhaustive. And if a lot of these names look familiar, it’s because you’ve seen them on the participant list for the Summit. Open Bibliographic Data Guide. This guide from JISC focuses more on open rather than linked data, but it’s a critical first step toward Linked Open Data. Programming the Semantic Web, Toby Segaran, Colin Evans, & Jamie Taylor. 2009. Great primer on graphs and plenty of example code. Linked Data: Evolving the Web into a Global Data Space, Tom Heath and Christian Bizer. 2011. This is a great book, recently released, that provides a concise and in depth exploration into Linked Data, from conceptual overview to recipes for publishing data. Rights and Licensing from JISC Open Bibliographic Data Guide. Recommendations for publishing Open Data for Libraries. Digital Cultural Collections in an Age of Reuse and Remixing, Kristin R. Eschenfelder and Michelle Caswell. Nov. 2010. This study examines the various views and considerations of cultural institutions in allowing reuse of digital cultural works. It’s based on a 2008 survey that is, in my opinion, just at the turning point of a rather radical cultural shift in opening metadata for reuse and sharing. Recommendations for independent scholarly publication of data sets, Jonathan Rees. March 2010. These recommendations come from the perspective of the sciences but can equally be applied to the humanities, and embodies the shift toward sharing data for future use and portability. I’m sure there are more articles to add to this list and please feel free to do so in the comments. 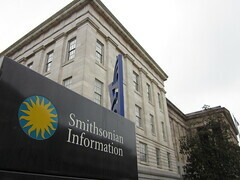 Smithsonian Information, Smithsonian linked open data? We’re continuing our discussions here at the Smithsonian about what we can do to make our data accessible in a linked, open manner. The other day I had some discussions with the staff at the Smithsonian American Art Museum (SAAM) about some possible projects that we can do that will have a short gestation time. Looking forward to sharing more at the summit. Just for the fun of it, I submitted a video postcard for Ignite Smithsonian, taking place 4/11/11. I was trying to capture the excitement of the emerging LODLAM community, in a 30 second spot. and led the internet revolution? Institutional decision makers can gain a firm grasp on the techniques, technology and terminology of Linked Open Data. Collaborative strategy will be developed to forward the adoption and promotion of Linked Open Data in the humanities in the United States. Actionable steps and strategies for sharing, publishing and licensing structured data on the Web will be widely distributed and publicized. The NEH joins the Alfred P. Sloan Foundation in their generous support of the Summit. The Sloan Foundation will support international participants and those from the sciences and humanities. Sloan funding also enables us to continue outreach and forward momentum on LOD-LAM efforts during the year following the Summit, including meetings and panels at various industry and sector conferences globally. The International Linked Open Data in Archives, Libraries, and Museums is the first gathering of its kind, and is being hosted by the Internet Archive in San Francisco, CA June 2-3, 2011.